The arrival of the latest Cowboys and Indians magazine is always a highlight at our house. It is filled with all things Western – art, history, movies, fashion, decor. It is a must read for anyone who likes the stuff that can be found in the West. With that in mind, I was surprised to find an article that bothered me. On top of that, it is dumb to let it bother me. After all, it is not about some controversial subject that leads to great debates. 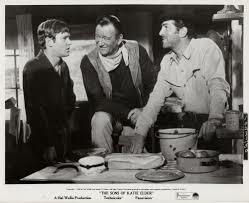 It is about the 50th anniversary of The Sons of Katie Elder, a movie starring John Wayne. What was bad about that? 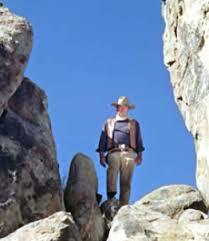 This is my favorite scene from the entire movie, and John Wayne is not sitting on a horse. He is standing on a rock. Bottom line, if you are charged with writing an article about a movie, then you should watch the movie. Heck, this is one of the first scenes. How can Joe Leydon, the writer, get that wrong? Anyway, those first sentences got the article on the wrong track, but there is another problem. This movie is not good enough to deserve a 50th anniversary commemoration. It is written with the theme that this was John Wayne’s first movie after surgery to remove cancerous tumors. That is a noble subject and deserves to be written. However, a better article would be about his fight through the years and not focused on this film. I am a huge fan of John Wayne and will read anything about him. I also understand that other people will do the same. That is why this magazine and others like it do all that can to put him in their pages. I just think that something better could have been written. What is my problem with The Sons of Katie Elder? The entire thing is filled with bad casting. The age difference between John Wayne and Michael Anderson, Jr. makes the entire thing unbelievable. In fact, one was 36 years older than the other. I guess that is possible, but Katie Elder must have been one heck of a woman. Oh yeah, there is one other problem. Who decided to use the name Katie Elder? In the movie, she is described by everyone as the best woman who ever lived. They do not even have the words to describe her goodness. With that in mind, they should have come up with a better name because the real Kate Elder was not filled with goodness. Big Nose Kate was a prostitute who hung around Doc Holliday. I will not go into the sordid details of her life, but I think about her whenever I watch this movie. Did she turn her life around and move to Clearwater, Texas? Was she such a good person in an attempt to make up for her past? I cannot separate the fictional Katie Elder from the real Kate Elder. I write all of that to write this. If you are going to write an article about John Wayne then write about John Wayne. If you are going to write about John Wayne’s fight with cancer then write about John Wayne’s fight with cancer. However, if you are going to commemorate one of John Wayne’s movies, then make it one of the good ones. On top of that, watch the movie first so you can describe the scenes accurately. I often wonder if the people who write about books and movies actually saw or read the stuff they are writing about. Often, I suspect not. It takes a certain kind of dumb arrogance to write about a movie you haven’t seen, or review a book you haven’t read. They are taking the easy way out. I don’t know if this guy watched the movie or not. I just know he described the scene wrong. You should at least make sure you know the scene you are describing. To me, it’s cheating. Like reading cliff notes exclusively and never cracking a book. I agree with you, I always thought the name Katie Elder was an odd choice. I don’t dislike this film as much as you but it would have been more believable if the fourth son had been a bit older. I have never noticed the 13 shot situation. Like all movie stars, John Wayne made some bad movies. This one is not the worst, but it is also not the best. I am interested. In your opinion what was the worst and what was the best? I will put some thought into that and come up with a post. John had a massive fan club of course, Top box office draw of his day. So, unfortunately, not all his movies were ‘inspired’. Some being outright formula stuff simply to exploit his popularity. Katie Elder might well fall in there. If it wasn’t for some Star Power: Wayne, Martin, Holliman, George Kennedy, and Dennis Hopper … it might not be worth watching at all. The concept wasn’t bad, but the execution could have been a lot better. Too bad really because he commanded enough power to do better work. But there’s a large gulf between his Classics and the Shootist. The story could have been a good one. It was just that some of the casting was off. There were some good actors in it, but something is missing.